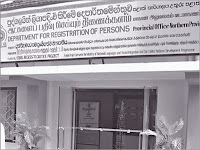 An office of the Department for the Registration of Persons was opened at the Vavuniya kachcheri complex yesterday by Commissioner General of the Department R M Sarath Kumara. The office building costing Rs 10 million was built under a programme funded by the UNDP. 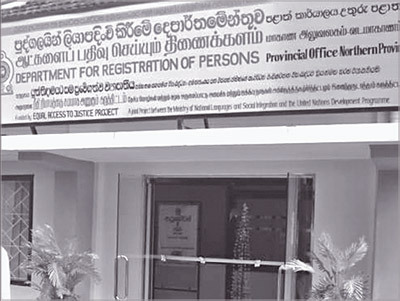 Speaking at the opening ceremony, Sarath Kumara said the new office the first of its kind in the outstations was opened to expedite the issuing of NICs to people in Vavuniya, Mannar, Kilinochchi, Mullaitivu, Jaffna, Anuradhapura and Trincomalee districts. They hoped to issue new NICs to the residents in the North especially ho lost their identity cards due to terrorism. He said the new office is equipped to issue an NIC to an applicant within a fortnight. Secretary Ministry of National Languages Malkanthi Wickremasinghe, Defence Ministry Additional Secretary S Hettiarachchi, Vavuniya GA Bandula Harischandra, Mannar GA Sarath Raveendra and Kilinochchi GA Rupawathie Kethiswaran were also present.